Generous donors have been pulling out all the stops to raise £100,000 as part of a special campaign to help pay for the restoration of Canterbury Cathedral’s organ. Launched in April this year, “Adopt a Stop” reached the milestone this week and added to the overall fund-raising by the Canterbury Cathedral Trust, boosting it £2.85 million nearer the final target of £4.2 million. After decades of faithful service, many components of the main organ had stopped functioning, including keys, pedals and the stops which enable an organist to let air into the pipes. The enhanced organ, currently being built, will be expanded to almost twice its former size and the organ loft moved to a new position. The Cathedral’s organ was last repaired in the 1970s, and was played at many historic occasions including the visit of Pope John Paul II in 1982 and the enthronements of four Archbishops. Cathedral Organist David Flood played it for the final time in April (2018) and a digital organ is being used temporarily for services and events. More than 6,000 organ pipes, some dating from the 17th century, are being repaired, recycled and replaced and Adopt a Stop was created to provide different ways to support the work, with a two-foot pipe available for £50, a four-foot pipe for £100 and a 32 foot pipe for £10,000 (as well as others in between). Sarah Frankland, Chief Executive of Canterbury Cathedral Trust, said: “I am happy to be celebrating this milestone in the fundraising campaign. This is a vital contribution to our wider organ fundraising campaign, which has a final target of £4.2million, and although we have raised over £2.85 million (including Gift Aid) to date, we still need to raise the remaining funds over the next year to repair and restore this magnificent instrument”. The organ is due to be ready for the Lambeth Conference in July 2020 when more than 900 bishops from around the world meet together in Canterbury. To support the organ project text: PIPE10 £10 to 70070 to donate £10, or visit www.thecanterburyvoice.org/adoptastop. 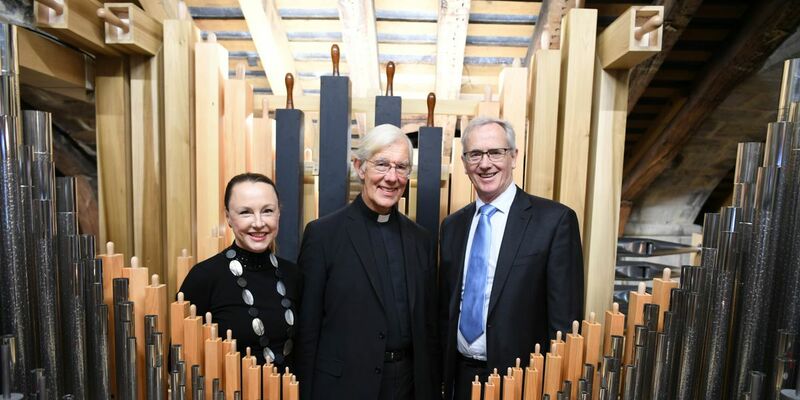 Image above shows (from left to right) Sarah Frankland, the Dean of Canterbury and Director of Music Dr David Flood with the new and restored organ pipes..